Vintage Spadea International Designer sewing pattern number NS-263 features Irene Gilbert of Ireland. "A chic two-piece dress by Irene Gilbert. 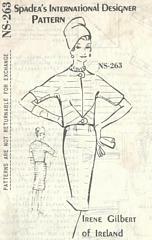 The overblouse slips on over the head, buttons at the neck and has elbow length sleeves. Released pleats give ease to the slim skirt. Especially good in crosswise striped fabrics." Pattern has been used and is complete.